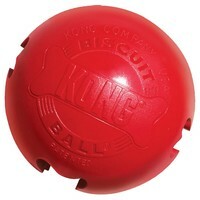 The Kong Biscuit Ball allows for many sizes of treats to be hidden inside. The Kong Company used a natural Kong Rubber for the food dispensing chewy toy. It can have treats in several little crannies and keep your dog happy for hours searching and hunting them out. It is great for training.